Engine: 4 Cylinder, 2.9, Sequential-Port F.I. 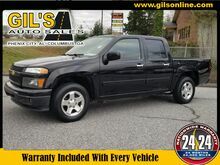 This Black 2012 Chevrolet Colorado LT might be just the crew cab for you. This one's a deal at $14,995. Rocking a gorgeous black exterior and a black interior, this car is a great pick. This is the vehicle for you! Give us a call today and don't let it slip away!